A U.S. Navy SEAL facing court-martial in San Diego pleaded not guilty to premeditated murder and other alleged misconduct charges stemming from a 2017 deployment in Iraq. 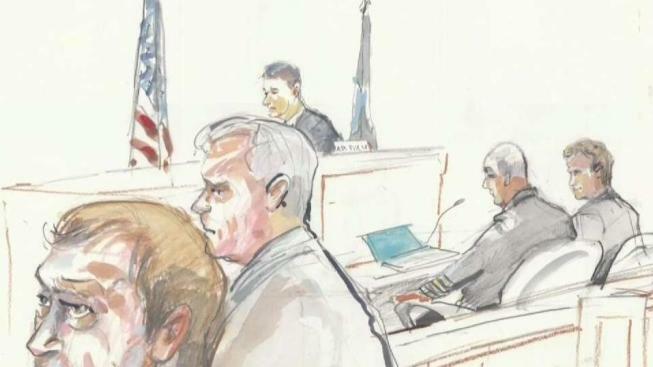 Chief Special Warfare Operator Edward Gallagher was accused of premeditated murder for the stabbing death of a teenage ISIS fighter by U.S. Navy prosecutors during an Article 32 hearing in November. Prosecutors say Gallagher posed for pictures with the fighter's body during a re-enlistment ceremony. The stabbing happened in Mosul, Iraq, in May 2017. Gallagher is also accused of trying to cover up the killing and celebration, and firing at unarmed Iraqi civilians. His defense attorneys hinted Friday that some of the people behind the initial complaints about the alleged misconduct have changed their story, opening the way for a narrative that his killing of that ISIS fighter was justified. "Special Ops, SEALs, MARSOC, Green Berets, they do kill people in combat. The question is, is it lawful? Now in this case, the question is did Eddie Gallagher murder this ISIS individual? And the answer is absolutely not," Gallagher's attorney Colby Vokey said. Vokey said he was unable to comment on any alleged photos of Gallagher and the body of the ISIS fighter due to restrictive orders. In court, Gallagher's defense argued that since his arrest last September there have been unnecessary delays in trial proceedings. Gallagher is being held in military prison but his attorneys say he should be able to await trial at home. Several character witnesses -- colleagues, family and friends -- testified on his behalf but a judge delayed ruling whether or not Gallagher can await trial at home until next week. Amid the proceedings, Rep. Duncan Hunter (R-50) strongly defended the decorated service member. Hunter, who said he reviewed Gallagher's case and also met with the Navy SEAL's family, released a statement detailing his thoughts on the case. "It is important to remember that this ISIS combatant was engaged in an extensive firefight with Chief Gallagher’s team and was already significantly injured when captured," Hunter said. "No credible evidence has been provided that this ISIS fighter was murdered as opposed to dying from his terrorist actions." The Navy has previously outlined its evidence, including cellphone photos that show Gallagher holding up the head of the deceased fighter during a reenlistment ceremony. Prosecutors also presented evidence that they say shows Gallagher tried to bribe fellow SEALs not to talk about the incident to NCIS investigators. "I have also received reports that Chief Gallagher is being confined to the brig where, allegedly, he has not been provided with quality access to medical care, mental health services or legal representation," Hunter said. If true, the representative said he would introduce legislation to ensure this situation is not repeated. "South American criminal illegal aliens are provided with better access to legal representation than our nation’s elite warriors because bureaucratic lawyers in the Navy justice system see this situation as an opportunity to make their name and advance their career," Hunter added in his statement. He also called on President Donald Trump to step in. "I believe that Chief Gallagher’s matter needs to be taken away from the Navy and President Trump himself needs to personally review and dismiss this case, taking an American hero out of a prison cell and back on the front lines where he belongs," Hunter said. His full statement is provided below. During his service, he was awarded the Bronze Star Medal twice, an Army Commendation Medal, and nearly a dozen other decorations.